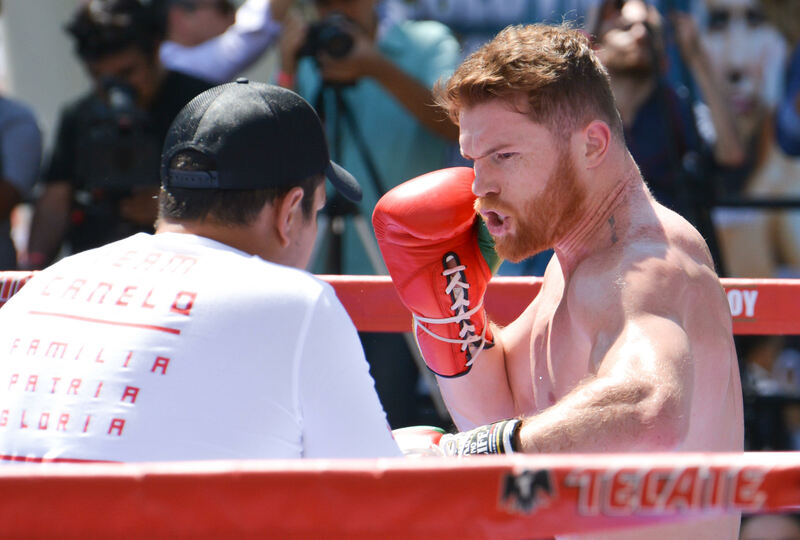 The Nevada State Athletic Commission (NSAC) has temporarily suspended Mexican star Canelo Alvarez 49-1-1 (34) after turning in two drug positive drug tests for the banned substance clenbuterol, the Los Angeles Times is reporting. Alvarez was scheduled to fight a rematch with undisputed middleweight champion Gennady Golovkin 37-0-1 (33) in Las Vegas on May 5 after their disputed draw last September. As of now, that fight is on hold. NSAC Executive Director Bob Bennett revealed the decision Friday afternoon after a meeting with the promoters for both boxers. “Mr. Alvarez is temporarily suspended for his adverse analytical finding, and an April 10 meeting with the Nevada Athletic Commission will fully address this adverse analytical finding,” Bennett said. Golden Boy Promotions, who represent Alvarez, say they have provided NSAC with sworn testimony explaining why clenbuterol was found in their boxer’s system on February 17 and February 20 at the beginning of his training camp in Mexico. After consulting with anti-doping specialists about the levels of the drug found in Alvarez’s system the commission felt compelled to discuss the matter further. The Los Angeles-based promoter issued a statement addressing the situation. Tom Loeffler of K2 Promotions, who represent the undefeated middleweight champ, said that suspension is mandated by Nevada regulations until a full hearing can be convened. “They told us Canelo has complied with follow-up testing and everything they’ve asked of him, but under their rules, they had to issue a suspension,” said Loeffler. Alvarez will continue to train as will Golovkin with a view to the fight still going ahead on May 5. Earlier this week a clearly frustrated Golovkin opened up with both barrels on Alvarez, his promoter Golden Boy and NSAC. A final decision on the status of the Golokvin-Alvarez rematch is expected at the next commission hearing on April 10.